Nobody knows Greece, the Greek Islands and Cyprus better than Olympic Holidays – and that’s official. More than half a million holidaymakers choose to travel with us every year and we have been voted the British Travel Awards’ Best Tour Operator to Hellenic Europe 2015. 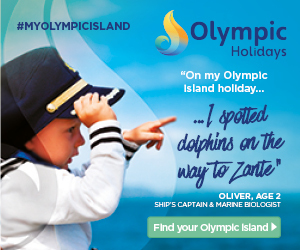 Olympic Holidays is owned and managed by a team who are passionate about travel and for almost half a century we have consistently delivered first-class holidays that combine excellent service with unrivalled value for money. Our experts’ in-depth knowledge of the destinations and desire to create magical holidays ensures guests benefit from the best choice of last-minute breaks to premium 5-star luxury holidays. Wherever our guests choose to travel they always have peace of mind as Olympic Holidays is licensed by the Civil Aviation Authority and holds an Air Travel Organiser's Licence (ATOL) and is a member of ABTA.